This Skinny Barbecued Shrimp recipe is a healthy easy version of classic New Orleans BBQ shrimp from Louisiana based healthy cookbook writer, Holly Clegg, that I adapted ever so slightly. Full of flavor and easy to prepare, this recipe comes together quickly provided you have shrimp on hand in your freezer. Did you know that Louisiana or New Orleans Barbecued shrimp have nothing to do with an actual barbecue? Good news, if you, like me, avoid anything to do with outdoor grilling or barbecuing! 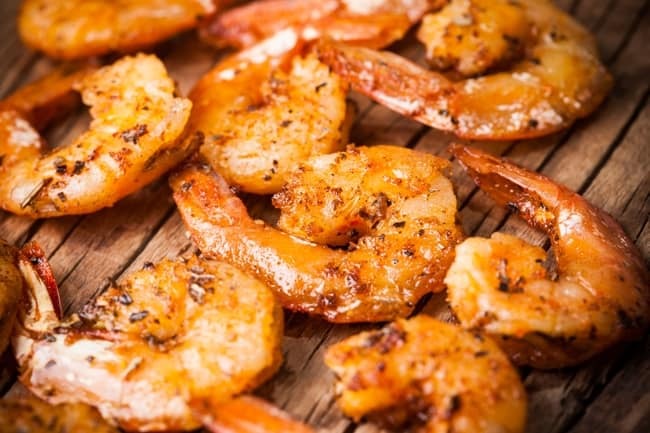 This popular southern dish actually refers to shrimp sauteed in a garlic and Worcestershire sauce spiked butter sauce. Traditional recipes call for shell-on shrimp cooked in an insane amount of butter. Not exactly Weight Watchers friendly. Fortunately I found a simple, healthy easy to eat Weight Watchers friendly version I think you’re going to love. We certainly did! Almost all shrimp are cleaned and flash frozen shortly after being caught, so for the freshest shrimp, you’re better off buying frozen and defrosting it yourself, unless you’re lucky enough to live close to where it’s caught. I try to buy shrimp labeled “shell split and deveined” which are super easy to peel. I like to serve this Skinny Southern BBQ Shrimp with warm crusty French Bread or Cauliflower Rice and Roasted Vegetables. Traditionalists may want to serve it on grits. This is most definitely a recipe I plan to make again and again. 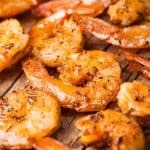 Looking for more easy, delicious Weight Watchers friendly Shrimp Recipes? Check out Crock Pot White Beans & Shrimp, Sheet Pan Roasted Shrimp & Broccoli, Skinny Shrimp Creole, Easy Shrimp Risotto, Southwest Shrimp and Black Bean Salad or WW No Cook Tex-Mex Shrimp Rolls! In large nonstick skillet, combine oil, Italian dressing, garlic, cayenne, Worcestershire sauce, paprika, oregano, thyme, salt and pepper over medium heat until sauce begins to boil. Add shrimp and cook for 3 to 4 minutes, stirring continuously. Add wine and cook until the shrimp are done, 3 to 5 additional minutes. Serve hot. Hi Leslie, Thanks for taking the time to let us know!! I have always been afraid to make shrimp but this recipe looked to good to not try. They were amazing. So easy and quick! In fact I have made them 2 more times and they are great cold as a quick snack. So happy to have helped you overcome your fear of making shrimp!! Martha wouldn’t it be 2 freestyle with oil being 8 sp for 2 Tbs, or is there a point hot the dressing ? How about using skinny girl for 0 sp? 2Tbs olive oil: 8 Points? 2Tbsp fat free Caesar dressing: 2 Points? 2Tbsp Worcestershire sauce: 1 Point? Being a true Southerner, I will have to make this recipe but serve it on grits. Makes the perfect combination! Hi Beth, grits sound like a delicious idea! What is a serving size? I can’t seem to figure it out. It is absolutely delicious!! Just want to make sure I don’t eat too much of it! I did not use the salad dressing–I used 2 tbl. butter ( unsalted good ‘ole butter). It’s difficult to decide which is better, the tasty shrimp or the crusty bread dunked in the spicy sauce. Think I mentioned to you that I live on the S.C. Coast. We love shrimp for Breakfast, Lunch, snacks and Supper ! Shrimp season opened yesterday-the freshly painted boats, usually bearing the name of a be-loved Lady, left the docks at 8 a.m. sharp ! The Shrimpers work so hard to bring us delicious morsels from the sea–let’s hope they have bountiful harvests and safe waters ! Ah, the joys of freshly caught shrimp! I’m very jealous!! Excellent! Even my Cajun hubby was impressed? So happy to hear it Meredith!